Turning the tide against ash borer? Tetrastichus planipennisi is an obscure little wasp that specializes in finding and parasitizing the larvae of emerald ash borers. On one hand, we’ve learned a lot about how to fight emerald ash borer with pesticides in the past 14 years since it was first discovered devouring ash forests in Michigan. But we’re still learning how nature keeps EAB in its place in its native Asian home. Insect parasites and predators are almost certainly the reason EAB is not a major pest on the other side of the globe. If only we could put some of those same beneficial insects to work for us! Then maybe we could slow the spread of EAB, and save our ashes at the same time. That’s the idea behind research being reported this month by USDA Agricultural Research Service scientist Jian Duan and other researchers with the US Forest Service and the University of Massachusetts. They looked at a tiny wasp, Tetrastichus planipennsi, that specializes in laying its eggs in the bodies of EAB larvae feeding under the bark of ash trees. 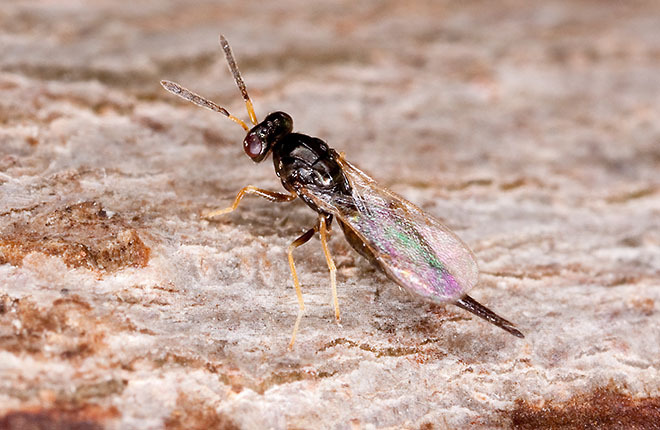 Over the course of the 7-year study the researchers saw a 90% decline in EAB larvae in infested trees caused by both native parasitoid wasps and by T. planipennsi. They believe that once these fighting wasps are released in an area they will reduce the population growth of EAB and perhaps prevent outbreaks in newly infested areas–like Texas. This will certainly be among the tools that the Texas Forest Service and others will be bringing into play as EAB makes its first tentative steps into our state. In the meantime, don’t transport cut firewood when you’re out camping this summer, especially in the Caddo Lake region of east Texas. And stay tuned for more news concerning the spread of this devastating insect. This entry was posted in Beneficial insects, Interesting insects, News, Pests of landscapes. Bookmark the permalink.